The robotic K-Max helicopter shown here in a file photo is flying re-supply missions in Afghanistan, opening up the era of unmanned logistics. Robotic helicopters capable of ferrying 3.5 tons of cargo in a single load are at work supplying NATO troops in Afghanistan, according to a defense technology blog. The helicopter is a Lockheed Martin / Kaman Aerospace K-Max designed for battlefield cargo resupply. Confirmation of its use in Afghanistan means "we're now in the age of unmanned logistics," Paul Mcleary writes for Aviation Week's Ares blog. 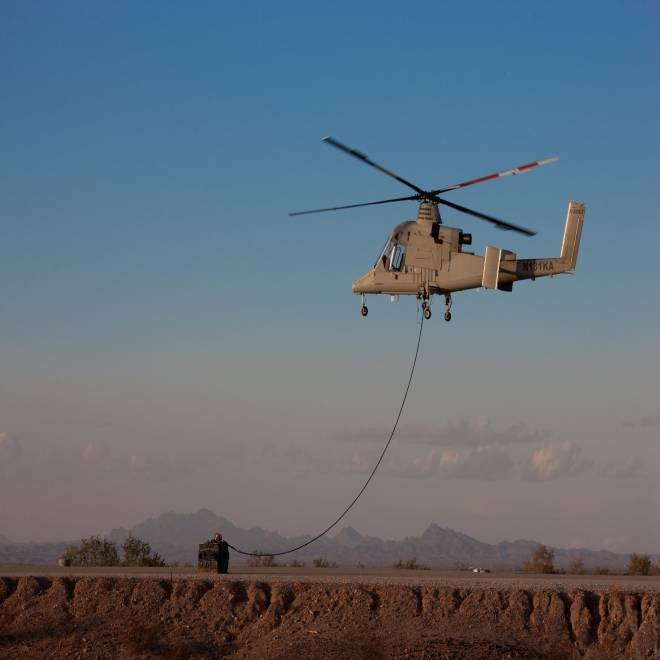 The technology will put fewer soldiers at risk flying over enemy lines on re-supply missions. That doesn't mean, however, that the military will put the helicopters directly in harm's way. "Most of the missions will be conducted at night and at higher altitudes," Marine Capt. Caleb Joiner, mission commander, said in a news release. "This will allow us to keep out of small arms range." While the helicopter should save lives on the battlefield, how might robotic choppers and other supply vehicles translate to civilian life? Feel free to share your wishes in the comments section below. Dog vs. robot: Which is the better soldier? Where nations used to compete to get into space, now the competition focuses on private businesses, pouring hundreds of millions of dollars into next-generation spaceships. Msnbc.com science editor Alan Boyle reports from inside the rocket factories on the future of spaceflight.